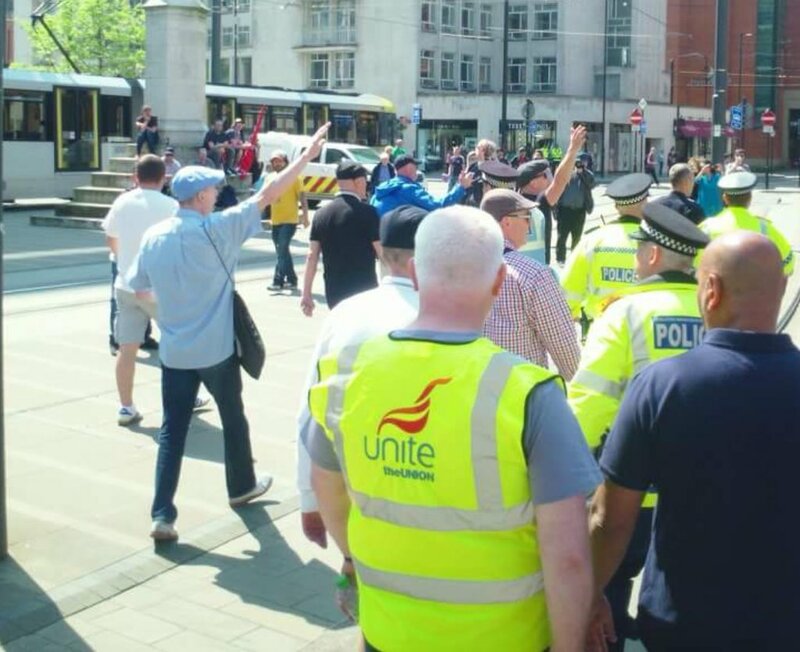 Hats off to anti fascists and anti-racists in Manchester, who at the weekend, well outnumbered and humbled the Football Lads Alliance (FLA), Unite Against Fascism wrote on 20 May. Last October, up to 15 000 supported the FLA on their London demonstration. Saturday saw only 300 attend their national event. The FLA had cynically tried to create further islamophobia as the anniversary of the appalling Manchester Arena bombing approaches. They failed, miserably, as Mancunians rejected their far right poison. 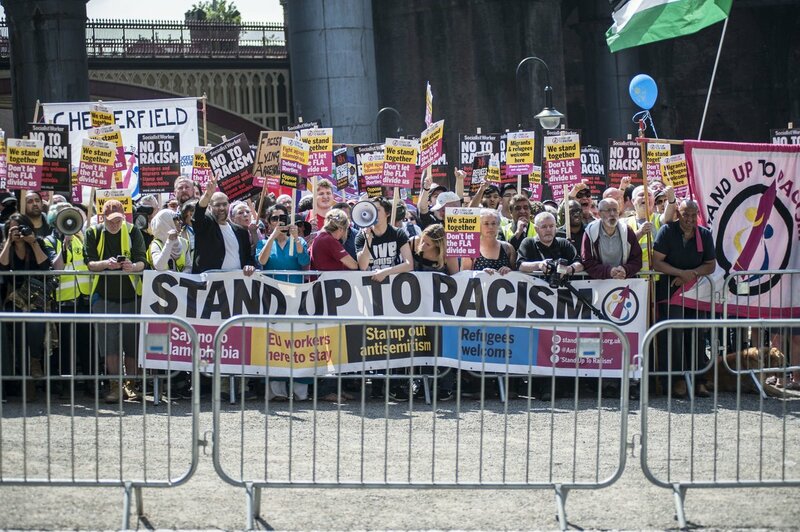 In contrast, over 500 anti racists joined a brilliant, spirited, Manchester Stand Up To Racism (SUTR) and Unite Against Fascism (UAF) rally and march. Where those on the SUTR/UAF mobilisation were confident and determined, FLA followers were dispirited and demoralised. The day started with an excellent rally in St Peter’s Square, by SUTR/UAF. Dan Hett, brother of Martyn Hett, killed in the Arena terror attack, made a particularly powerful speech, saying he was proud to be on the anti racist demo. ‘The FLA don’t care about the victims of the bombing, they only want to spread race hate. We will resist them with all the unity and organisation we have shown today’. Dan had overnight, again received appalling abuse and hate from FLA supporters, and other far right, bigots. It is to his immense credit that he spoke and marched with anti racists, honouring his brother. A mix of multicultural Manchester saw a number of trade union banners present. Union members came from the following unions; the CWU postal workers union, the civil service PCS union, the two largest unions in the UK, Unison and Unite, the fire brigades union, the FBU, the GMB, lecturers union, UCU, USDAW, the teachers union, the NEU. and the rail union, the RMT. A large delegation of Spanish students brought the message of No Pasaran to the demo! This fantastic cross union gathering was the product of weeks of intensive work, at a local and national level. The hard work paid off handsomely and much credit must go to local SUTR members and organisers. Manchester is a great example for how to build and create a well rooted, broad and strong, united front. 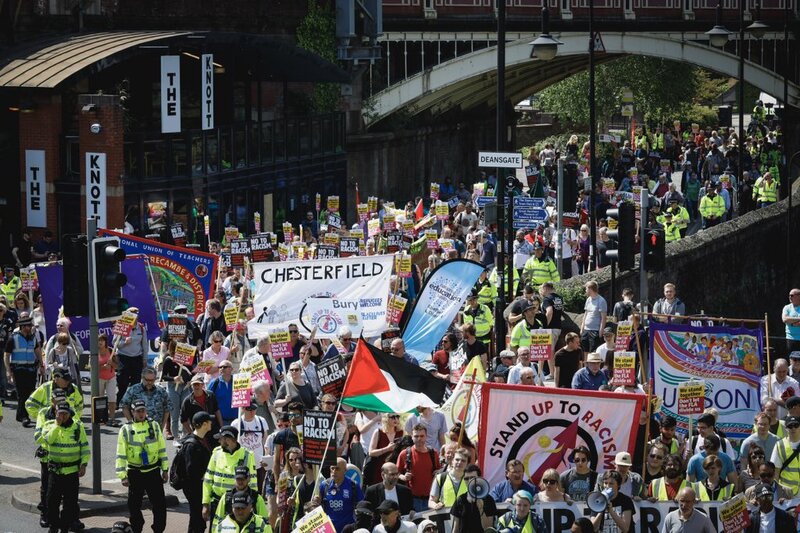 The sun shone whilst anti racists rallied and heard from a variety of national speakers from unions and the local community eg muslim representatives from Manchester. A minutes silence was held for the victims of the Arena bombing. In a moving occasion, local councillors read out the names of all those killed at the Arena, last year. Those who showed no respect for the victims and their relatives such as Dan Hett, were FLA members. Small groups of the FLA tried and failed to intimidate anti racists, and had to skulk away. The strength and size of our rally clearly unnerved them. FLA coaches from Newcastle and Yorkshire had been cancelled in the week, indicating that the FLA turnout was not to be impressive. The FLA held an underwhelming rally, with only 3 speeches. The FLA had misled their members by saying before Saturday that they were to march. SUTR/UAF strongly suspected this was not to be the case, and when FLA supporters were told they were just having a rally, tempers in their rally flared. FLA members openly argued with each other about why they were not the size organisers had promised. Many traipsed off to bars, missing the speeches and took to online denunciations of FLA organisers such as Pamela Brannigan. Rows raged overnight attacking the ex EDL members who now run the FLA. Indeed, the likes of ex BNP and EDL organiser, Chris Renton who stayed in a pub with other former EDL members, are wondering if the FLA has a future. (Perhaps a quarter of the FLA support were ex BNP and EDL followers. 50 or so stayed in 2 pubs, clearly downcast. Anne Marie Waters For Britain members, were also present). The whole run up to Saturday didn’t bode well for the FLA. Their event page for the demo was often poorly visited and unattractive to FLA members. Brannigan and co were repeatedly warned that holding an event on the same day as the Royal Wedding and the FA Cup final was potentially going to end in a flop. FLA leaders ignored such strictures and have rightly ended up, in a bad place. The splinter from the FLA, the Democratic FLA (sic) lost no time in asking FLA members to join their march in Manchester, on June 2nd. Ever the racist opportunists, the DFLA sense the chance to clean up from the FLA, the latter clearly being run by incompetent racists. 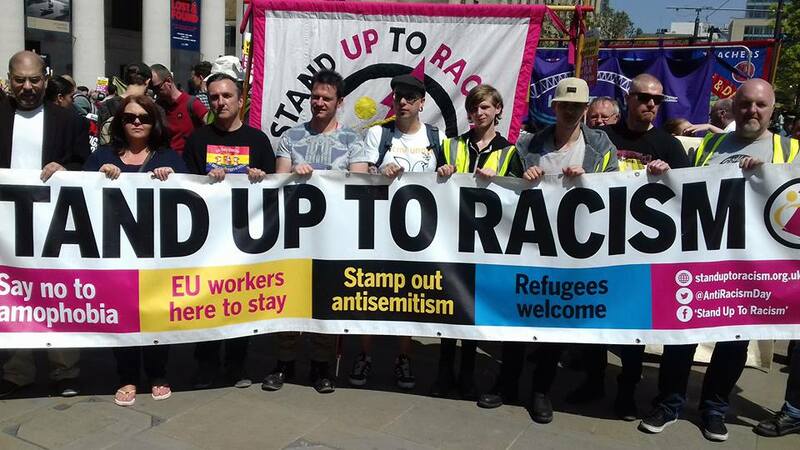 That anti racists were the only ones who marched today was telling and a point not lost on the FLA. After anti racists saw for themselves that the FLA were visibly deflated, spirits were very high. We marched back to St Peter’s square whilst the FLA moaned to each other. Onlookers en route applauded anti racists. The FLA’s poor turnout reflects the problems they’re suffering, after founder John Meighan’s departure. Manchester SUTR/UAF have shown the way. Delegations came too from SUT/UAF groups from Newcastle, Glasgow, Birmingham, and Leeds, among other places. Our side left buoyant and confident, the FLA could be heard in several pubs holding inquests as to what had gone so wrong. Their closed wall is full of comments, saying it was some kind of inepititude that sees their size plummet in just a matter of months. 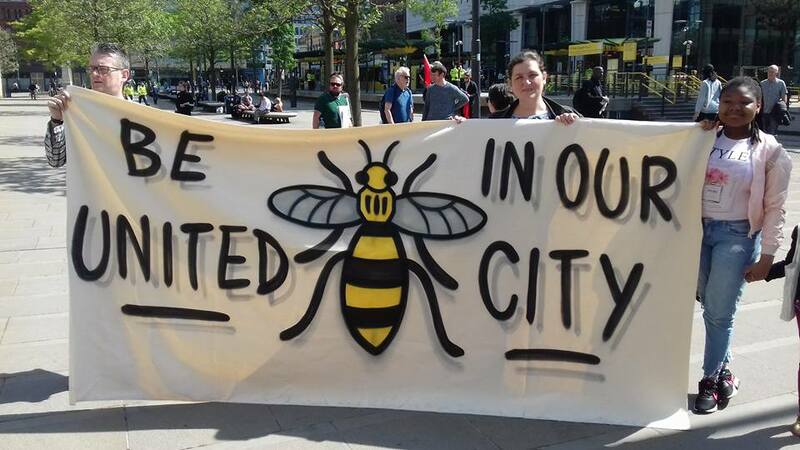 However, as said, on June 2nd the so called Democratic Football Lads Alliance visit Manchester. Their turnout will be larger than the FLA’S. Though there is an England international football game on the day, coaches are being booked from areas such as the East and West Midlands. Anti racists can take heart from today. The method and organisation of this mobilisation shows how to undercut the far right. The event page for the SUTR/Uaf counter demo is here. Please share it widely and come to Manchester on the day.